Wild Game Reserve is an online slot game developer established in 2012 by a group of like-minded individuals. Headed up by Ashley Lang, the team has more than 85 years of combined experience in the industry. In a short space of time, Wild Game Reserve has made its presence felt in the online gambling market and is already leading the way with its fresh graphics and pioneering bonus features. Click here to read more. 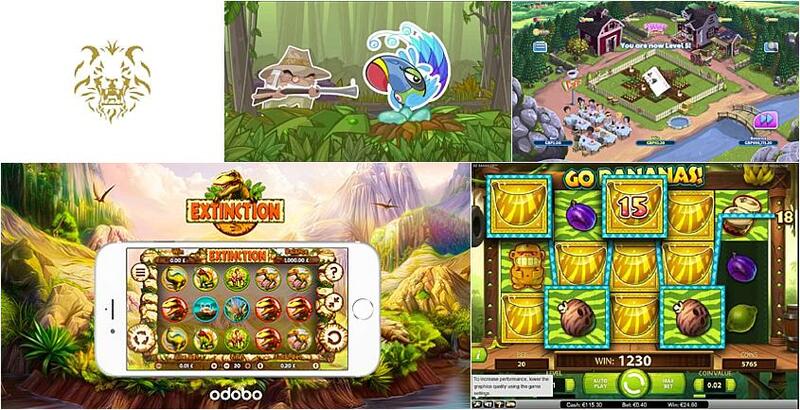 Extinction is an online slot powered by Odobo, and based on a prehistoric world. As you would expect, Wild Game Reserve provides high-class animations which includes huge dinosaurs and meteor showers. It also has a range of exciting features like the Free Spins, which offers opportunities to win big. Gourmet Ranch Riches is a highly innovative and original game developed by Wild Game Reserve. With no paylines or reels, the game is far from the usual slot games on the market, and instead resembles a video game. The game is set on a farm where animals and vegetables appear in turn, to create a list of ingredients which can cook up into some really nice wins. Independence Pay is yet another Wild Game Reserve slot game released on the Odobo platform. As its name suggests, the game is based on the blockbuster film Independence Day, featuring Will Smith. In this comical Sci-Fi slot, aliens invade Earth and it is the player’s job to rescue all of humanity before it is too late. The Oddventurers is an online slot that features a group of explorers trying to find a specific species of bird – known as a ‘bird of pay’. This fun game is set in a jungle and has stunning graphics, as can be expected of Wild Game Reserve developers. As you will have noticed, numerous games developed by Wild Game Reserve are executed on the Odobo platform. There is a very good reason for this: Wild Game Reserve is Odobo’s in-house game development studio. The Odobo platform allows Wild Game Reserve to reach a very wide audience via numerous online casinos. The Odobo Platform is also dedicated to responsible gambling and as such it is committed to checking the age of its players and offering tools to allow them to keep their spending in check. All of Wild Game Reserve’s slots are developed using HTML5 technology, so players can access them using a range of desktop and mobile devices, including iOS, Android and Windows platforms.